Formed in 1995 with the acquisition of the Longboat Observer, The Observer Group Inc. has grown into a family-owned and operated multimedia company with five newspapers, three websites, a quarterly arts and social magazine and more than 80 employees serving multiple communities around Florida. The Pelican Press is a 40-year-old weekly community newspaper that primarily covers Siesta Key, one of the barrier islands of Sarasota County. So what does displaying the Verified logo mean? It means that you're committed to the highest standards of accuracy, transparency, and accountability. 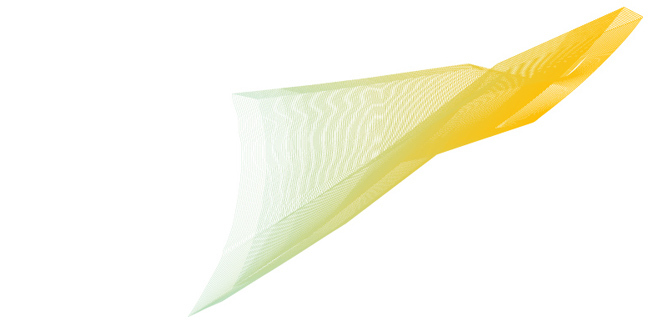 For more than 50 years, Verified's logo has stood for leadership, innovation and integrity. Make Verified's logo work for you and let your advertisers know they can buy with confidence. At the recent D10 conference, Mary Meeker, the well-known Internet analyst now at Kleiner Perkins, made a whirlwind presentation of how the digital world is changing. She projected a slide showing how fast iPods were adopted, then the much faster rate that iPhones were adopted and then the even faster rate of adoption of tablets. Finally (not to be Apple-centric), Meeker showed that Android phones are growing at an even faster rate. For many of us, it's hard to believe change can indeed accelerate, but now it can be said that change is the only constant. Change has been accelerating in how our readers and viewers access our media, and therefore we must change how we publish to our market. At the same time, our audience is also changing the way they gather information that leads to purchase decisions. So our advertisers are changing their perception of their marketing services needs. Mobile devices are winning more of our audience's time, and yet the traditional revenue stream to support media distribution � advertising � is much harder to deliver on digital devices, especially on those with very small screens. When you try to manage change, the first challenge is to determine what not to change. What are the constants your business is built upon? Core customer needs don't change. The change is in how these needs are filled. What are you doing to understand your customer's changing lifestyles and advertising-styles? Do your employees understand what is happening in their market and how to help you develop new solutions for your customers? If they don't, you can expect to be left behind by the change. In today's fast-changing media world, there are two things you can do: invest in the relationship with your customers, and invest in more training and development to help your people adapt to the change. How many online publishers plug a piece of software code into ther ad server to serve ads sold by a network or real-time buying platforms, and then marvel to see others doing the same thing, driving supply up and prices down? These publishers don't own their customers; the network or RTB platform does. How much better off would these publishers be investing in the sales and marketing efforts it takes to develop direct relationships with advertisers? Your salespeople (BTW, you need to have salespeople to "own" advertiser relationships) must develop deep and multi-faceted relationships with your client companies. For them to do so, you need to invest in your salespeople and provide them with training and information resources that allows them to bring value to the customer relationship. This same "own the relationship" approach applies to your readers. If you �re expecting your traffic to come exclusively from Google Facebook or Pinterest, you don't own those relationships. If your readers are loyal enough to come directly, or sign up for an email, you have direct ownership of their time and attention. If your content isn't good enough to achieve that direct relationship, then you've just identified a place that needs investment. It used to be that media companies had a training program for new hires, and that was the end of it. Now training needs to be ongoing, a constant in your budget. Send your people out to industry conferences to learn about new technologies and techniques and hear how others are harnessing them. 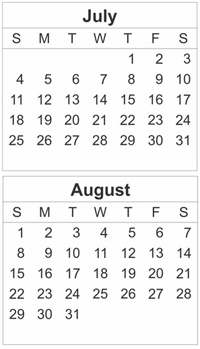 When they come back, have them present the ideas they learned to your team. Bring experts in to train your team and to introduce new ideas and new tactics. Do research on your market to understand your customers' changing needs. With training and development, and with investment in owning and understanding your customer relationships, your company can develop the new revenue streams you'll need to supplement declining advertising rates: new services for either advertisers or readers. 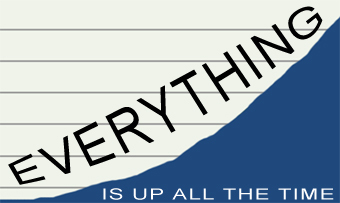 Without those investments, your business is toast. 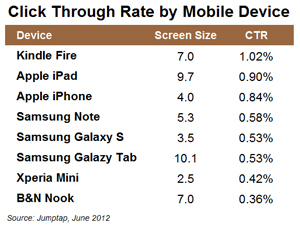 According MobileSTAT from Jumptap, screen size doesn't always matter when it comes to mobile ad performance. Data from the study showed that the Amazon Kindle Fire, which measures seven inches in length, had a 1.02% click-through rate (CTR) while the slightly larger, 9.7 inch iPad had a 0.9% click-through rate. 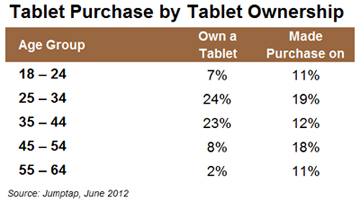 While tablets tend to have higher CTRs than smartphones, screen size isn't always a predictor. Paran Johar, Chief Marketing Officer, Jumptap, says, "What makes the mobile market thrive are the...features, functionalities and form factors of each device." Ownership of tablets and purchasing on tablets is heaviest among older Millennials, those 25�34 years-old, says the report. Millennials as a whole, ages 18�34, are most likely to use an iPad, while Baby Boomers are the heaviest users of the Kindle Fire. On Kentucky Derby day, mobile traffic around Louisville, KY grew steadily as the day progressed, then spiked in the evening shortly after the race. At the time of the race itself (6:24 p.m.), there was a brief dip in local traffic, likely due to fans looking up from their devices to watch the action. For advertisers planning campaigns around live events: expect a surge in traffic directly following the event itself, says the report. Based on analysis of mobile ad campaigns by companies in the Quick Service Restaurant industry, consumer interest in fast food ads peaks on the weekends QSR ads see CTRs that are 9.9% higher than average on Saturdays and 5.9% higher than average on Sundays. 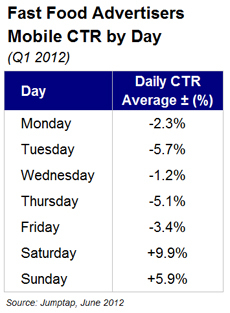 The same ads garner their lowest CTR on Tuesday, which came in 5.7% lower than the average. Finally, eMarketer estimates that there will be 54.8 million tablet users in the U.S. by the end of 2012, with the number jumping sharply to 89.5 million users by 2014. A Mobile Branded App is defined as a digital application of a publication's editorial content created specifically for tablets, smart phones and other mobile devices. Qualified Mobile Branded Apps must have the same masthead title, editorial focus and minimum frequency as the print publication. Apps that do not deliver the same editorial content, such as games or data, cannot be qualified. Mobile Branded Apps downloads must be reported separately in the Audit Report and Publisher's Statement. Because every in-house system or app developer may be different, please work directly with Verified to determine what is needed to audit your app. If all data available meets Verified's standards, Mobile Branded Apps will be included in the reports as qualified [italics]duplicated[/italics] circulation. If you have questions regarding Mobile Branded Apps, please contact Verified at 415-461-6006.